I can’t believe how amazing I feel after just one session, I felt like I was really at a loss before I came and saw you. I am so much happier and actually enjoying everyday things without worry. Thank you so much, it’s the greatest gift I have ever been given. Going to Karen Degen was the best decision that I could have made for my myself. Even if I thought it would be just a good tune-up to my life and set me on the right track to the future. It was that and so much more. I have done the councilling thing before in my life and ended up stirring up alot more things than I put to rest, coming out feeling like someone had put me through the ringer. When I went to Karen I came out feeling like someone had lifted a tramping pack full of rocks off my shoulders and I didnt even know that I’d been carrying them.I also came out with a clearer understanding of who I am, where I’ve been and where I am going. It meant that the next step that I had to take in my life both in work and personal things I had the strength and fortitude to take it and see it through. Thank you so much Karen.What you do is worth it and totally awesome! 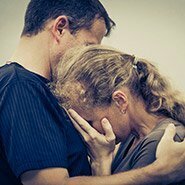 As Grace would have it, I found Karen Degen by accident, looking for an EFT professional to help me when I was in a helpless and lifeless mode. At that time, I experienced suicidal depression accompanied with constant panic attacks. Prior to that, I never understood depression, always thinking that it was some kind of a laziness, people who were not wanting to see the brightness of life. Boy was I wrong…. Being a single mom of a beautiful teenager, I knew I had to be ‘healthy’ for my son, yet I was on the edge, due to constant fights I had with my ex-husband, my high stress level job, the long winter and sudden loss of direction in life. I knew that medication was an option, but believed that everything happens for a reason and my panicky state was for a reason too. And it was – my body was screaming for a freedom. Karen went with me to my ditch and grabbed me from that hopeless place, walking with me back slowly at my own pace, crying with me and loving me all the way. I will never forget that. She took my hands and re-visited my soul with me, showing me that life is still there, waiting for me to take another chance. After several Skype sessions, I was on a recovery road. Karen saved my life and I can only say that I cherish and love her and her work more than the words can describe. I went to Karen to seek help for the vague feelings of stagnation and inertia. To seek answers to the question why am I not moving forward? What’s wrong with me? Why am I stuck in what appears to be ground hog day with only transient joy in my life. I felt like I was always on the verge…. the verge of what, I didn’t quite know – happiness? success? I was waiting for life to happen to me. In fact, my initial email to Karen inquiring about her service and what the heck the EFT thing was all about reads quite prophetically “… I have a few niggling things that I feel are holding me back from engaging more in my life and from progressing. I’m all a bit too stagnant for my liking. Working with Karen allowed me to logically uncover aspects of my past and present that stubbornly stood as a blockade to my present and future enjoyment of my life. Buried stuff that I didn’t even have the presence of mind to acknowledge or even identify. Karen gently and adroitly unlocked my “I’m fine” box to safely allow me to recognise my desperate need and desire to have my fathers approval, contact and expressions of love. I just simply wasn’t good enough for anyone and for myself unless I had achieved my fathers acceptance. Unfortunately this infiltrated so many other areas of my life, grinding me to a halt and projecting that belief like a noxious weed. I also harboured fears that there was just no point in trying or starting anything new because I’d always get it wrong, it just wouldn’t be good enough. My first session with Karen left me remarkably un-lumbered. I woke the next day tired but incredibly lighter. I never knew I was carrying around such emotional weight. So much was uncovered and released in the space of an hour and a half, it was bewildering and… life became so much clearer. I now wonder why the heck had I been lugging all that previously unidentified baggage around for so long! I truly felt free and unattached to it – it just was. Where once a raw subject would come up in conversation I would choke back tears (or not) or dismiss the topic with derision, it now floats pass me like jetsam. It just doesn’t have it’s hold or power over me any more. It just was. It just was something that happened. It is no longer a belief that lurks to second guess the value I hold in myself. Within 1-3 visits with Karen, it felt like I could actually see the wood for the trees. I can appreciate that this all sounds a bit woolly, and I certainly wasn’t the sort to find saviour in these methods, but what I did finally find was myself, and I am enough. I am enamoured by Karen, her practice of the EFT technique and her other coaching tools. I have such great admiration and appreciation for her helping me achieve so much so effectively in such little time. Even when I didn’t know what the crux of the matter was! And I suppose that’s the best part – a bit like discovering an iceberg. 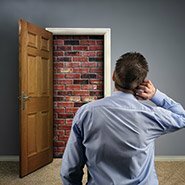 If you don’t feel at the top of your game and you don’t know why and if you’re open and willing to see and uncover the barriers in your way, it is in my experience that you couldn’t achieve personal success faster. Good stuff happens and it happens quickly. Thank you Karen. I couldn’t have got here without you. 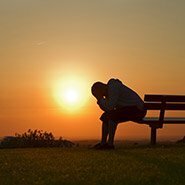 Before I had my one and only EFT session with Karen Degen I was on the brink of clinical depression. I had found out in March this year that my townhouse in New Brighton was a “leaky home” and all the horror that goes with that. I already have a large mortgage and have been told all the windows and doors of the house and the cladding have to be removed and replaced at a cost of probably around $100,000. My situation is that I am a woman on her own working in a parttime job while I bring up my 12 year old boy. So, as you can imagine, my income isn’t great. When I was first told about the leaky home my body reacted by rocking back and forth for quite some time in what is recognised as a sign of trauma. I remember sitting at my dining table alone in the evening just rocking and rocking. That’s how traumatised I was. When I went to my doctor and asked for help with my lack of sleep around this time he sent me to a councillor who told me I was on the edge of being clinically depressed. So you can see the state I was in. Two lovely friends who had been attending sessions on EFT told me how simple and easy and successful EFT was so I went along to a session Karen was giving and after listening to her speak thought it was worth a try. I then made an appointment to see Karen and spent one and a half hours with her feeling teary and upset at the beginning of the session; I learnt how to do tapping and say the right words and by the end of the session I felt stress free. It was so remarkable that I actually told Karen I still felt I was stressed on a scale of four out of ten as I couldn’t actually believe that after everything I had gone through in the past five months that I could feel nothing when I thought about my leaky home. But, while driving home I could not stop myself from grinning and feeling a wonderful lightness and stress free feeling! I immediately emailed Karen when I got home and changed my ration to zero out of 10. Over the past weeks I have purposefully thought of my leaky home to try to remember what the stress felt like, and I just can’t, it’s gone. I still have a leaky home, that’s the reality, but it doesn’t bother me any more. I can’t wait to go back to Karen to work on other aspects of my life. I was a Gambler. I played the Pokies for over 10 years. I was very lucky to start off with, won a lot of money and before I new it I was hooked. Not having anyone else to answer to, I just kept on going and eventually lost my own home. Over this period I saw at least 3 different Specialist Gambling Counsellors, as I rang the 0800 gambling line for help. After each period of counselling, going back through my childhood, and things that happened to me in adulthood, or learning about the chemical changes in the brain as I play the machines, I continued to gamble. I may have stayed away for 3 weeks at the most, then back to it. I would go when happy or sad. The Counsellors suggestions were to do something I really love doing at the times when I would normally gamble, but I was doing these things, and gambling as well. I always came away from the sessions wanting something more in the way of help and knew there should be something more for me, but what? I needed something to make me stop! I had friends who gambled as well who encouraged me to come along with them. I did not want to share my problem with my friends or family as I was too embarrassed. So where to go from there? Lucky for me I moved away from my home town to Christchurch and through a friend here, I went along to hear Karen give a talk on EFT. I had heard about EFT before but couldn’t fine any information on websites I looked at, where EFT had helped with gambling addictions, so wasn’t sure it could give me the help I was looking for. I enjoyed Karens’s talk and went along to some more meetings on EFT before I made up my mind I wanted a session with Karen, to see if she could help me. I was very embarrassed and it was a huge thing for me to open myself up again. I am an intelligent and sensible person, and to have done what I had done to myself, quite shocked me. Well I had one and a half hours with Karen and went from a 10 (being so wanting to go gambling) down to a 1 in that time. I did my tapping homework to work on the last little bit. I was on cloud nine for weeks, I have not played the pokies nor do I want to, since the day I saw Karen on June 25 09. So do not hesitate to use EFT to help with ANY problem you may have, I use it all the time for whatever I need to, and it works, without a doubt. I am so grateful I found Karen! She is exceptionally good at what she does, she has a gift to get right onto the problem area to fix whatever is troubling you. I have had two EFT sessions with Karen, the first was in person, at the end of a trip I did to New Zealand and the second was over Skype from Melbourne, Australia. Both EFT sessions were very successful in releasing old/negative emotions I had been holding on to around certain events/people. I came away from both EFT sessions feeling either on top of the world or relaxed with a sense of freedom. I was really delighted and surprised with how quickly Karen could get to the heart of the matter through various questioning and then clear out these deep emotions around the issue using EFT which I found to be a very simple yet very effective and powerful technique. 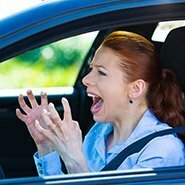 The first EFT session I was able to release strong resentment and anger I had towards an ex work colleague that I had been holding onto for some time. I was surprised with how quickly I could release this. I then moved onto emotions I had been holding onto from a past relationship that was having an impact on the potential of any current relationships. The second EFT session (via Skype) was just as effective as being in person with Karen. In this session I was able to clear up some old emotions I was holding onto around my Mother that were having an impact in my work situation. In both EFT sessions I was given a set of tools from Karen that I could use at home, as well receiving a follow up email containing the summary of the session. I am very grateful to Karen and would highly recommend Karen and EFT as a tool in clearing out negative emotions which assist in living a life more in the flow. I am one of the world’s big cynics but I am also open to give things a try. With Karen’s money back guarantee I thought I had nothing to lose. I went to see Karen because I was having trouble with my eating. I felt out of control. I could not stop eating. I had forgotten what it felt like to be hungry. Working with Karen we pinpointed the trigger for this behaviour – a period in my life where money meant I was short of food. Since then I had been in fear of going without. One session with Karen and using her follow-up techniques a couple of times, I have lost the need to constantly eat. I can wait until I am hungry. If I am not hungry, I won’t eat. I have also become more discerning about what I eat. If it isn’t exactly what I need for that meal, I tend to go without. I know – go without a meal!! I am not deprived. If I really want to eat something I will, and I don’t have any guilt about it – nor do I feel I might as well carry on eating “crap” food. My weight is slowly starting to come off, but I am happy with the progress I have made. The feeling of being back in control – priceless! Would I recommend Karen? Yes I would and I do. Thank you very much. Before I met Karen I was an overweight perfectionist who procrastinated, was scared of making mistakes so wouldn’t start things, held onto “stuff” from past relationships and experiences and here I am writing a testimonial! Definitely not possible before I met Karen. My first visit to Karen was for help with what I thought was Earthquake trauma after Christchurch’s most devastating earthquake in Feb 2011. I soon learnt what I was feeling was a number of issues and some I had suppressed for years and recent events were just the catalyst that brought them to the surface. Karen is very skilled at working out the underlying issues. I came out that day discovering my fear was not just going back into a multi-storey building but also I did not want to return to the pressure of my main employment and be tied to the office. The next time I went into work I had the freedom and was clear to renegotiate my position and hours and am now working in positions I enjoy. After such an amazing result and with Karen’s ongoing help I have been working through other issues that have plagued me for years. I was surprised at how many of the blocks I have been working on are linked. EFT is like flicking a switch on or off. I am proud to say I flicked one of my switches and after being overweight for many years I am now 22.7kgs lighter to date and still going… Sceptical? I would highly recommend giving EFT a go. You have nothing to lose and everything to gain. My thanks to Karen and EFT. My Problem… I had wanted to be a Group Fitness Instructor for 2 years and never went for it because fear of freezing on stage, not being very good and didn’t really want to have everyone looking at me on stage. (Something of a problem as people would need to look at me to be instructed!) I had kept making excuses as why I shouldn’t go for it. Then about 3 weeks ago I met with Karen for a coffee and she did just a simple questionnaire on me- No EFT stuff- just asked about 10 questions. After that meeting it got me thinking and I realised that I had been holding myself back for fear of not being liked or failing and disappointing people. I took the plunge and auditioned to be an instructor; I got through and then freaked out as I had to teach a track within a week of deciding to train to become an instructor and even though it was only 4mins 55 seconds long I can honestly say I was petrified… I went through a fair few of tissues at Karen’s house! My email to Karen after teaching the track… Well I did it…it was not perfect (in fact it was quite comical and a bit of a disaster) but I did it and it can only get easier and better from now on. The microphone pack fell off my waist as soon as I started running so I had to teach the first part using actions whilst the instructor tried to attach the mic pack back to my waist! I was fine though- it’s unbelievable- yesterday when I was practising (and practising my tapping!) I tried to recreate the anxiety and the overwhelming upsetness (not a word I know) that I had last week and I just couldn’t. It’s very strange…even now when I think about it I still get a flutter in my stomach but it’s not a bad thing but I cant get that feeling back where I just start crying…I wonder if I will cry ever again! (I’m sure I will ) You have no idea what you have done for me…it’s so awesome. I can’t wait to try other scary stuff now and see how I get on. I have to teach again tomorrow morning and tomorrow night and I am almost looking forward to it. I’m more excited than anxious anyway. I have the module (3 days of training this Friday, Saturday and Sunday where I will have to teach in front of teachers who will be watching me like a hawk) and I am not scared to death. Plus I have volunteered to give a presentation to a group of advisors in Auckland (for my real normal job) in a few weeks time. They are all male and scary and I am going to be absolutely fine because for some reason I don’t feel an overwhelming urge to worry about annoying/upsetting people anymore and my main priority is to not worry that people don’t like me. I’ve been seeing Karen for the past few months, initially to help clear some emotional blocks in relationships. I’ve found EFT to be incredibly helpful in clearing out excess emotions which for me resulted in an amazing feeling of freedom and clarity around relationships that were previously quite painful and areas where I had felt blocked. I also found Karen fantastic to work with in that she allowed me to look at and work on areas that I was ready to address without any pressure or judgment which always made me feel very safe. 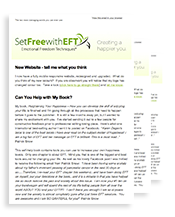 EFT is such a simple but hugely effective tool to use. I really don’t think I could have handled the pain of my recent relationship break-up and the ability to move in a new direction with my life if I hadn’t used EFT on myself and in counseling sessions with Karen. It has been an absolute godsend and I would strongly recommend EFT and certainly Karen’s services as an EFT practitioner and counsellor. I met Karen Degen through my networking group and booked an appointment with her and tried not to be too skeptical! The issue we worked on was my fear of birds and their flapping and moths and them getting stuck in my hair! After we completed the process I went home and turned the outside light on to attract moths and would you believe … none came! I tried this for several nights and couldn’t attract any moths. Low and behold I was in the kitchen one evening and a moth flew in the open window I batted it away and thought nothing of it until I looked over at my husband who had a look of shock on his face. It was then that I realized that I hadn’t reacted. I can’t tell you how many times that has happened lately and I even had a moth land on my head and just brushed it away. Can’t believe it – they are just not an issue anymore! This is an amazing technique that can help so many people with whatever emotional issues they may have. I am now on my way to becoming like everybody else, my life has completely changed. After only two sessions of EFT I stopped pulling my hair out, which I’d been doing for 15 years! It’s magic and it would certainly work with you whatever your problem is, just have a go with EFT. I came to Karen to receive EFT on my anxiety around speaking to new people in business. As a coach, I need to be fully confident and this was a weak area for me. Although feeling a bit sceptical about the effectiveness of EFT, I can honestly say that after just one EFT treatment my anxiety and intense fear was minimised by 80%. The other 20% disappeared after a few days. I have not felt any anxiety or fear around speaking to new people since. I fully recommend EFT as a fantastic technique for eradicating anxiety in any situation quickly and effectively. I have been working with Karen for several months with simply fantastic results. I am the first to say I don’t understand how EFT works but to be honest it doesn’t matter because the results speak for themselves. I had been through some trauma earlier in the year and was having nightmares, one session and my night mares ceased. In another session I asked Karen to work with me on my anti morning behaviour. As a business woman I was very aware that my reluctance to get up early in the mornings was something I needed to work on. Giving myself several stern pep talks, setting the alarm and asking my husband to open curtains just made me grumpy! But one visit to Karen and I was waking up and getting a head start on my day with ease. I’ll say it again, how it works is beyond me but it does work! These are just two examples of “issues” Karen has helped me with, there have been others and I am truly grateful for the freedom her assistance has given me. Freedom from crap if I can be blunt J. If you are reading Karen’s testimonials you are obviously considering making an appointment; I can’t say strongly enough, pick up the phone. Thanks Karen, you are fantastic! I came to see Karen after suffering from depression for a number of years. EFT and the advice Karen gave me has helped me turn my life around. I am now in a place where I am happy and the future is something to look forward to not dread. Thanks so much Karen, you and EFT have made such a big difference in my life. Hi my name is Matt and I had an addiction to legal highs for a number of years and tried to stop on a few occasions but it wasn’t until I was referred to Karen that I was able to kick the disgusting habit through her EFT coaching. I would defiantly recommend her to anyone that wants help with anything she’s very friendly and I felt comfortable talking about anything without judgement and helped me to see the light at the end of the tunnel thanks Karen. When I went to see Karen Degen I had a goal to stop feeling frantic. I’m a single parent of 3 (9, 11, 13), am studying full time, am a home owner with 2 tenants and work part time for myself as a massage therapist. I’d also just started a new relationship with a woman which was outside of my comfort zone. My goal started to feel un-achievable. Through EFT I have been able to reduce the stress in my life and be more present. I’m still busy but am more effective and don’t get overwhelmed like I used to. Karen has helped me improve my quality of life J The best bit is I’m still getting better at EFT so the benefits will only increase. I have recently just had my second Endometriosis surgery and due to a recommendation from a friend to see Karen it was a totally different and much more pleasant experience than my surgery 3 months prior. Due to past experiences I had a huge fear of hospitals, being put under anaesthetic and surgery. So when I was diagnosed, not only did I have the emotional side of the diagnosis to deal with, but also the fear of the upcoming surgery. Unfortunately I did not address this and my experience in the hospital was horrible. I had a panic attack when I was being put under anaesthetic, which made my body react horribly when I woke up and I believe had ongoing effects through my recovery. This added to my already existing fear and I was told that I needed to have another surgery in 3 months. A friend of mine recommended Karen Degen. I must admit that even though I am fully on board with a lot of alternative therapies I was pretty skeptical, but I was prepared to try anything. The moment I met Karen I felt at ease. She has a very kind heart and an ability to really understand what you are going through. After my first session I had results and after a few more I was ready for my surgery. I felt strong, in control and confident about my surgery. It was a totally different experience in the hospital and my recovery has gone from strength to strength every day. The fear I had was consuming me and holding me back from having a positive frame of mind about my Endometriosis and getting better. I cannot thank Karen enough. I would recommend Karen to anyone who needs a gentle, caring hand in overcoming any emotional obstacles that are holding them back from being the best person they can be. Dear Karen, I hope you are well! I’ve been meaning to email you for weeks and tell you my news. I’m now 23 weeks pregnant! The IVF worked the first time which was incredible. We have found out that it’s a girl and I’m very excited to meet her in 4 months. I really want to thank you because when I think back to this time last year when I had post traumatic stress disorder – I was so unhappy. I know that my body and mind was in no shape to carry a child. I know that some people take years to get over PTSD (if ever!) and I felt back to normal after 2 sessions with you! I don’t think I would be having a baby in 17 weeks if it weren’t for you and EFT. Thank-you so much! At the age of 3 my son was treated by a paediatric dentist who surprised both him and us by suddenly administering what was obviously a very painful intramuscular injection of sedative into his buttock without any prior notification. This traumatic event resulted in our son who is now 10 having an extreme fear of needles to the extent that various medical professionals have been unable to administer vaccinations remove foreign bodies such as splinters or carry out blood tests without sedatives or anesthesia. Recently he was required to undergo another blood test and rather than go through all the additional arrangements for anesthesia we decided to try EFT with Karen to deal with the underlying trauma. I obtained an injection and syringe and hid this from him, whilst Karen went to work tapping away with my son on the issue. Prior to starting she asked my son how terrified he would be if I were hypothetically able to produce “an injection” and it was off the scale. By the end of the one hour session not only was I able to miraculously produce this injection, but my son was removing it from the wrapper himself and role playing having a blood test on his arm. At the end of the session he asked me to take him to the laboratory for the test. Interestingly I too am not that fond of needles and had to have a blood test myself last week. Normally I feel tense and am unable to watch but for the first time ever I talked calmly to the Nurse and actually watched as the sample was taken, so by following along with my son during the session I also gained personal benefits. I was very impressed not only by the EFT itself but by Karen’s, calm reassuring manner and her ability to relate so well to children of this age. Only two sessions with Karen and I have made a decision that I have been procrastinating over for at least two years. This was a really big one for me. – Walking away from a career which I had been involved in for over two decades (and providing a fantastic life style and income). I was gripped by the fear of stepping away from security and into the uncertainty of what to do next, especially as I am in my mid 60s. My gut was telling me to take action but I continued to ignore it. Two sessions with Karen and I have resigned from my position with relative ease and look forward with anticipation to what the future has in store for me. I now have a tool to use when faced with the next difficult situation. Thanks Karen. You’re a GEM.